Pepper, aka Bob's Peppercorn, is a 6-year-old red brindle male born February 18, 2007. His sire is Stan's Boy Flyer and his dam is Bob's Fraschilla. Pepper has just 14 races to his credit on Greyhound-data.com. 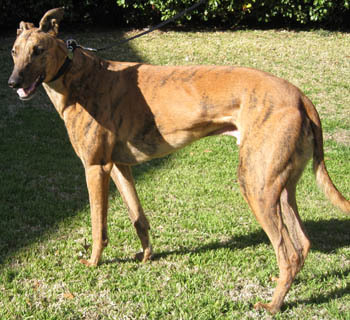 His first at Southland on July 28, 2009, and then continuing at Gulf Greyhound Park from July 11, 2010 to February 19, 2011. 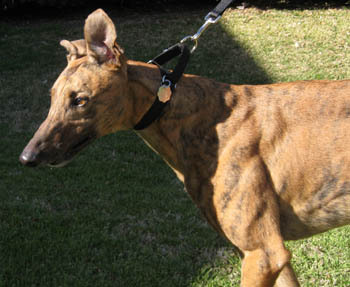 From the time he retired to his arrival at GALT, Pepper was in Gulf Greyhound Park's Adoption Kennel, but his forever family was not be be found there. Pepper's 2nd digit on his right rear foot had been amputated well prior of his arrival. It causes occasional limping if it is overused in walking. Pepper is a big, happy boy! Pepper should not live with cats. Pepper has one of those greyhound noses that seems to go on for miles! It ends in a cute overbite. He's a big, goofy, happy boy. He loves to roach on his back. He is an active sleeper - we've caught him running in his sleep, eating in his sleep, and even sitting up to stare at nothing before flopping back down while never waking up! Pepper doesn't really play with toys, but he has opinions on the arrangement of toys. If our other foster leaves a toy out in the room that Pepper believes should stay in the crate, he'll grab it and put it back in the crate. What a character!